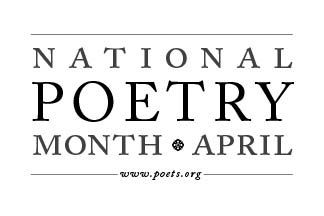 Bookmark Dragon: Happy National Poetry Month! The Powers That Be have decreed that April is National Poetry Month. I happen to love poetry, both reading and writing it, so I'm pretty excited about this. Do you ever read poetry? Poetry can be so powerful and expressive, but unfortunately so few people take the time read it. Which is ironic since it takes the least amount of time to read a poem than to read just about anything else. Other than perhaps a Twitter update. SO! I hereby issue a poetry challenge to you, lovely reader. I challenge you to read five poems by the end of the week. Just five. They can be any length, written by anyone, at any time. Pay attention to your mind before and after you read. At its best, poetry can change the way you think for the better. Which makes it worth it. The first one is a fun one by Jim Daniels, whom I actually heard in person at a reading during grad school. He's a great one to hear in person, if you ever have the chance. The second poem by Jack Gilbert is actually quite personal for me, since it helped me get through a miscarriage I suffered a couple of years ago, and has remained dear in the years since. The third poem I just love for its quirk and its insight. Something about the phrase "Mackerel essence" just gets me every time. The fourth poem is wild and loose and urgent and free and perfect. And, lastly, the fifth poem is a pretty famous poem by E.E. Cummings which helped ignite my love affair with poetry. in me. The Cheez Whiz in me. and it makes different muscles take over. without ever putting the box down. to save in case we ever came back.